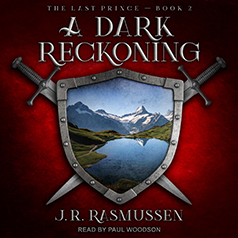 J. R. Rasmussen presents the second book in the Last Prince series. To defeat his greatest enemy, he may have to become his greatest fear . . .
Now that he's come home, Wardin is determined to reclaim all that was lost. But when his enemies unite against him, he finds himself outnumbered and outmatched, and his kingdom in more danger than ever. Amid these threats comes a chilling warning against walking the same treacherous path as his father before him. Desperate not to repeat the failures of his forebears, Wardin turns to mysterious new allies and perilous new magic. And even that may not be enough. To win this war, he'll have to trust the unfaithful, sacrifice the irreplaceable—and perhaps even do the unthinkable. Yet win it he must. Because if Eyrdon falls, magic will be next.